Nothing quite brings the country dweller down from their Back to Eden aspirations like a flourishing crop of weeds running wild over the land that they fondly slated for productive growth. We went away for 5 days after school was done and when we got back the jungle was encroaching. It has been raining buckets this spring, meaning we didn’t get our gardens planted until last week. The lawn went to seed for a while before we made hay, and the goats cannot possibly keep up with their pastures, even with their nonstop chewing. We made a plan to bring the rank growth into submission. Using all the weapons in our arsenal, we have been making slow progress. It’s times like this that we are glad our property is limited to less than five acres. I will not mention the options that rhyme with keed-willer or pound-sup since they are bad, bad, and we try to be good with our weed control methods. That is not to say that we never resort to desperate measures, but I will list our favorite methods. Salt. Nothing fancy, certainly not Epsom salts, which will actually enhance the root systems of vegetables. Just buy ordinary table salt. This works well for fence rows, in sidewalk cracks, along walkways, and to my astonishment, on asparagus beds! My in-laws taught me this trick. They suggest salting the bed once a year, then mulching heavily on top. It works like a charm! Somehow the asparagus continues to thrive while the weeds do not. In other areas, salt will produce more of a scorched earth look, so be careful where you dribble it. Boiling water. When I do water bath canning, I pour the scalding hot water on weeds in the driveway. Nice and easy, except for the part where I haul a huge kettle full of boiling water through the house, trying to hold it at arm’s length. An easier method is to fill the tea kettle and then pour the boiling contents onto such things as pesky wild rhubarbs or evil start-up vines of poison ivy. I try to hit some of the leaves, but especially the roots right by the stem. Garden gloves and old-fashioned bending over to pull weeds. You can walk through your grounds daily, nipping things in the bud as they come up. This is not terribly effective if you have too much garden to keep up with. I almost cannot walk past a weed when I get in this mode. It’s terribly distracting. I just wanted to cut a head of lettuce, and here I am, halfway down the onion rows, pulling red-roots. A sharp hoe. Some people hoe a section every day. I will never forget the sight of African farmers working patiently through vast plots with short-handled hoes. It’s a good practice, very effective if you are into bodily exercise that profits much. We have a grass catcher on our mower, so every time we mow, we pile the clippings around garden plants. This works, but it gets weirdly slippery. Old hay or straw is great mulch for keeping the soil moist, but it is not so great for weed control because the seeds in the bales will abundantly compensate for every weed that is smothered. Maybe you will be fortunate and get very clean hay. It’s a risk I prefer not to take after one year when I had wheat growing all over my garden on top of the mulch. Composted manure with straw or sawdust is a wonderful option. Sourcing this requires becoming buddies with a farmer who is willing to let valuable by-products leave the farm for other places. We tackled the problem by becoming the farmer. It required building a barn, then building fences, then buying a menagerie that obligingly ate what we fed it and turned out bushels of poo mixed with their bedding so that now we have a fairly steady supply of mulch for the gardens. Since the chickens have already scratched through the compost, there are very few seeds left to cause trouble and the plants fairly leap into the air when they receive rain water filtered through fertilizing mulch. We also mulch with wood chips, especially around the base of the fruit trees and berries. I don’t recommend twisters, but if you have a storm that takes out a bunch of your trees, you might as well dry your tears, cut the firewood, and run the branches through a chipper. Wait a year and the pile of chips will be fine mulch. Alternately you can take up spoon carving and collect the chips. We have a number of failed kuksas and spoon blanks scattered around the blueberry bushes. The easiest, least economic way involves carting loads of mulch home from a distributor and spreading it. If you mulch as heavily as you should, about 4 to 6 inches deep, you’re going to run into a bit of money. Last week my greenhouse friend and I were fantasizing about gardening in heaven. Everything peak season, always bearing fruit, no pests, and no weeds! It’s a tantalizing thought. We just aren’t there yet, so we deal with it. It’s my repost day, and I would like to make a public service announcement: The flu is really bad this year. Have you noticed? My husband keeps telling me what an awful strain of flu this year is packing. This is not to be confused with stomach bugs, which are bad enough. It is the aching, please-let-me-just-die-now flu, and sadly, many immuno-compromised people are dying. By the grace of God our family has not experienced anything worse than common colds this entire winter. We have two people who are supposed to be extra susceptible to germs in our house. Aside from trying to stay away from germy situations, I keep waiting for it with my weapon that I stock in my fridge all winter long. I often get asked for this recipe, and I suppose you could always search for it in the archives where I posted it four years ago, but here it is, with love and a few edits. Bring first 5 ingredients to boil in a saucepan: simmer until reduced to half, about 20 minutes. Squash berries and strain mixture. Add honey to strained liquid: pour in a glass jar and store in refrigerator. Take 1 tsp or more when cold or flu symptoms start, up to 3 Tbsp a day. This is safe for children, but because of bacteria concerns in the raw honey, it is not recommended for children under 1 year of age. There it is! My go-to potion when anybody in our house sneezes or sniffles/pukes or flus. I got this recipe from my sister-in-law, Rhonda, who got it from a friend… I don’t know who really gets credit for the original, but it is really good. I tweaked it a bit, and sometimes I stir in 1 TBS of bee pollen. The ginger soothes upset stomach, and we find it too cloying with over-much honey, even though raw honey has many healing properties. It also preserves the syrup for a long time in the fridge. I have seen other recipes where people add lemon juice, and the product you buy from Beeyoutiful contains apple cider vinegar. My children struggle a bit with the sourness of the flavor, so I haven’t added it. Yet. As you can see, the recipe is quite open to interpretation, made as pleasant or unpleasant as you like. Edit: The cloves are the spice cloves, whole ones. Somebody I love dearly thought it was garlic cloves, which probably would also help the immune system, just not too tastefully in this preparation. She was ready to cook her concoction when it dawned on her that something was not quite right. The star is elderberry, lovely elderberry. Elderberries are effective against both bacteria and viruses, and act to prevent viruses from entering cells. Taking elderberry syrup, extract or juice can lessen the duration of flu symptoms. 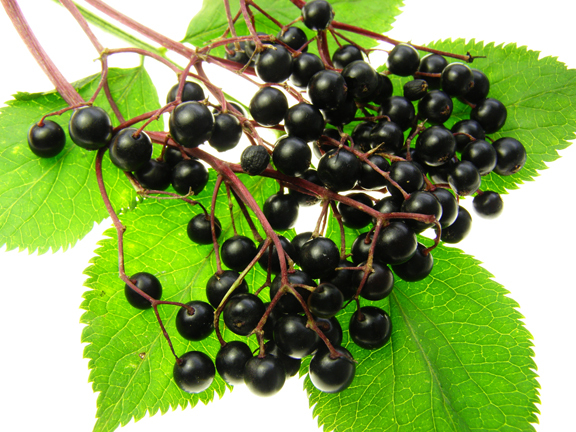 Elderberries contain anthocyanins, potent antioxidants that protect cells from damage. Anthocyanins also boost the immune system by inducing the production of cytokines, small proteins that play a role in regulating immune response. Photo credits here, along with another informative article on flu-fighting elderberry studies. Listen to what they say, “A study published in the Journal of Alternative and Complementary Medicine…found that elderberry decreased the symptoms of influenza (including fever) within 2 days and achieved a cure of influenza in 2 days in 90% of the group receiving elderberry, compared to 6 days with placebo. The most interesting thing about this study is that it was looking at Influenza type B – a type of influenza that Tamiflu and Amantadine are not effective in treating.” I would so prefer to feed my family a medicinal berry made by God than a drug with dubious side effects, which might make you feel even worse than you did before you took it. I want an elderberry bush. Actually, I would like a whole thicket of elderberries, so I could share with all my friends. I bought my freeze dried berries at Sunburst Superfoods. The price for one pound is less than the price for one (smallish) bottle of elderberry syrup, already prepared, which is why I bought them, of course. edit: I now have two elderberry bushes. The dog loves to chew on the stems, for some odd reason, and the birds have a way of robbing all the berries before they are quite ripe. Also, they are very tiny and labor intensive; the stems are toxic; it takes a lot of berries to make a pound of dried ones! It made me feel good to try raising them, but my best sources are still the bulk herb stores. There is a source for already made syrup, which is what I always bought before I started making my own. I can heartily endorse the products from Beeyoutiful. See link above. Does this actually work? Yes, it really does. I stay on the ball with dosing someone who is starting with flu like symptoms, and we rarely have any sickness that lasts longer than 2 days. I keep them dosed every couple of hours. Give it a try, and let me know what you think. State of the blog: So I suddenly realize that it isn’t June anymore. Actually, I noticed that it is past mid-July and I haven’t written anything besides a daily sentence or two in my diary. If it weren’t for that, in future one might assume we went dormant for a month in the year of twenty-sixteen. State of the homeschool: Last year we had our first day of school on July 16. I am a duck out of water here, okay, but not totally okay, if you know what I mean. I cannot scrape up even a modicum of enthusiasm for the pond that is school and books, even though it is simmering in the back of my mind that I really must dive in very soon. I bought paint for the schoolroom and I organized the new books on shelves. That is all. We don’t have a single new pencil in the house. All of them are ground down to little nubs and the copier paper is gone, down to a teeny stack in the printer. All this means back to school sales and stocking up, which is actually fun. I will take the troops and roust out the deals and then we will sharpen new Ticonderogas and feel the sap of learning rising. State of the garden: Gasping with gratefulness for the thunderstorm that settled the powdery dry dust last night and greened up all the wilty things. We are in a lull currently. Nothing but Swiss chard, cucumbers, (for fresh eating only. I no longer make pickles. I don’t enjoy it and we hardly eat enough to bother, so I gave myself a permission to skip it.) And we are awash in raspberries. It is a very good kind of flood. I am flash freezing them on cookie sheets and putting them in gallon bags, literally. We are fondly waiting for the first vine-ripened tomatoes and when that happens, we will be at the pinnacle of summer. Oh yeah, I forgot zucchini. State of my mom’s health: Lots of you know my mom and will rejoice that she is improving daily. It was pretty much six solid weeks of infirmity and debilitating pain before she started to gain ground. She is puttering in her house and kitchen again and looking as positively as she can at the long haul of recovery from Lyme disease, which ended up being the dastardly culprit behind all the neurological symptoms. We thank God for healing, and for healthcare professionals who pour out themselves to help along the healing. State of the soul: Wanting to get fatter, but definitely not as lean as earlier this summer. It is a known fact that feeding the souls of others, specifically my children, requires reserves in my own soul. I learn slowly, but I do learn. I think. And Grace is so… kind. I feel keenly the kindness of God, the “daily loading of benefits”. I want to share them. I don’t want to keep them all in my own cellar. Here, children, have some goodness today, and you are welcome. State of the bookshelf: Well, The Rise and Fall of the Third Reich on audio is hard going. I have been working on it for a very long time and am only halfway through the 50 plus hours of narration, at the point where Germany is bullying Poland around. I only get the high points. It is a tedious history with very many footnotes and quotes. But there are some striking impressions. I didn’t know that the German people voted Hitler into power. He promised to make their country great again, to bring back economic prosperity at all costs. Enough people had this as a top priority, so that he came into his position as dictator at least sort of legally. There was plenty of weirdness going on behind the scenes, but the people did really want what he was promoting. Unless they were Jews, of course. And the propaganda fed to the public was just ridiculous. It is interesting to draw comparisons in an election year in America. To offset this heaviness, I just finished reading the Princess Bride which is definitely the most amusing thing I have read in a long time. The author is extremely clever. It is fantasy, so if you don’t like when things don’t totally make sense, this is not the book for you. To offset the frivolity, I have been reading Philippians again and again. “Finally.” I have been looking up all the times Paul said that in his letters. He seemed to condense his last bits of advice at the end, kind of like mothers say, “Now be good and don’t forget to thank the hostess for the food and help with any chores they have,” as their children go out the door for an afternoon at a friend’s house. The Philippians “finally” is so simple and profound. This week I want the God of Peace with me. The title is misleading, since anyone who has ever grown peas knows there is nothing that easy about either growing or processing them. If you have planted a substantial amount of them, and you have picked the rows, you stand up with a genuine case of pea-picker’s back and make your annual vow not to do this again. Ever. But you said it last year too. What is it that brings us back for more punishment every year? It’s the flavor, the sweet, bursting orbs of brilliant green that you simply cannot get any other way than by putting in the work yourself. Well, if you happen to live near Amish country, you might be able to buy a few bushels that someone else raised and picked. If this is the case, you should never ever make them feel bad for the price they are asking. But I digress. The easy peasy processing that I grew up with is a mystery to many of my friends. Since I love you all, I will share with you a detailed step-by-step to help you out. Of course, there may not be anyone else out there that wants to improve on the pea experience, but on the odd chance, I will give it a shot. That black holey kettle is a steamer basket, which you fill to the top of the holes with peas. Hopefully you have a responsible big boy who started the steamer kettle boiling a half hour ago so that you do not have to wait for it. But if not, you can have another cup of coffee. When the water rolls like that, you are ready to gently lower the steamer basket into it. Don’t plop it in or you will have overflow and a stained stovetop to contend with when you are done. And yes, this water has blanched a few batches already, hence that interesting browny-green color. But you use the same water for the whole batch, only topping it off with some fresh water when it boils low. Set your timer for exactly four minutes. At two minutes you select a long-handled spoon and give the pods a stir. If you don’t do this, the bottom ones in the basket will hog all the hot water and the top ones won’t blanch properly. Bonus points if your spoon matches exactly. When the timer goes off, slowly lift out the steamer and dump the blanched pods into a cold water bath to shock them into submission. I mean, so they stop cooking and don’t get squishy. Once they are cooled down, (and depending on how cold your water is, you may need to drain and repeat) drain off the water and start shelling. See that vast countertop? But what I want to show you is the blossom ends on the pods. When you shell them dry, they fall into the shelled peas and you get to pick and pick and pick and wash and wash and sort and sort them out. And then you still have to blanch the peas and cool them before you put them into the freezer. If you blanch the whole pod, they float off into either the boiling water or the cooling water. You eliminate that whole fussy step of cleaning the peas. And you don’t have to blanch them. They are ready to go once popped out of the pods. I do mean popped out. There are several methods. I prefer a twist, which my son and I had fun trying to catch on camera. It sort of looks like you take a pod by either end and twist it into an S.
It’s a law of science: you apply pressure and something has to give. Only it takes just a teeny amount of pressure, since the pods are pliable. Here is a tip: you want to make sure the thinner edge of the pod is pointing down into your bowl, unless you want a faceful. Children find it easier to just slide their fingers along the pod and strip all the peas out the end. It’s really fun! The last step is to corral a charming little girl whose mother did not comb her hair before the operation began, tie an enormous kerchief around the wispy curls, and give her a measuring cup to fill your freezer containers.